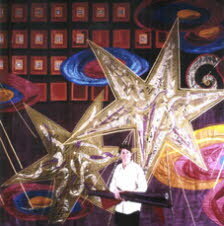 I have worked on some large scale commissions over the last few years. 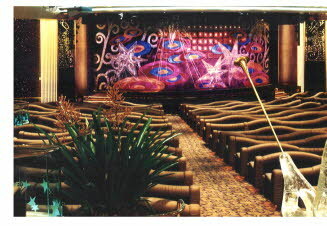 I was successful in securing the commission to embroider a large stage curtain for the theatre on board the new Royal Caribbean Cruise Liner ‘Legend of the Seas’. The richly textured artwork, ‘STARLIGHT SERENADE’ , incorporated printed, stitched and applied fabrics, with Austrian crystals, beads and sequins.